I am still in Scandinavia, metaphorically speaking, for this one, although if you have to be somewhere that is as good a place as anywhere else. 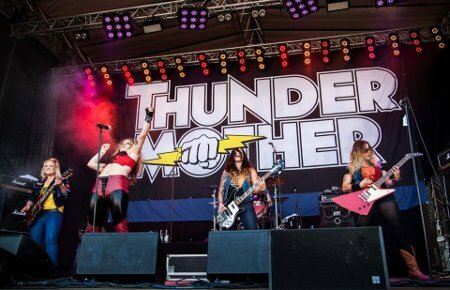 This time it is Sweden and an all-female band who go by the name of Thundermother. I say Swedish, well most of them are and they are based there, so Swedish it is. They have been making quite an impact around those parts (calm down boys) having played the prestigious Sweden Rock Festival as well as with the likes of Bonafide. Just to get you in the mood, a potted history of the band goes something like this... they started summer 2010 in Växjö when the guitarist and southern Swede Filippa Nässil wanted to play Rock N' Roll. So with dreams and visions along with the song 'Shoot To Kill' humming in her head she started Thundermother. She moved to Stockholm to pursue her dream. She found her first partner in crime, Giorgia Carteri, in Stockholm who also followed her own dreams of playing music, coming all the way from Italy, though nowadays she's identified as one of the southern Stockholm people. After numerous ordeals with other musicians, they have finally found the right group of people with right motives and Rock N' Roll in their heart. Tilda Stenqvist on drums from Karlstad, Linda Ström from the Smålander woods and Clare Cunningham born and raised on Ireland, nowadays living in Dublin. So to the music... 'Man With Blues' starts things off and the first mood that hits you is very much ACDC influenced riffery, classic era ACDC that is. The band don't shy away from the fact though and make full use of it. Vocalist Clare Cunningham actually has a little of the Bon Scott timbre about her voice thrown in to the mix, along with an impressive range, which adds to the feel. Twin guitars of Filippa Nassil and Giorgia Carteri fit well together, riffs powering their way to the front but with more than enough widdly bits to keep anyone amused. Tilda Svenqvist keeps the rhythm more than well, speeding and slowing the whole thing when required, and makes more than good use of the cymbal side to the kit. Last but by no means least, bassist Linda Strom is well suited to Tilda's banging rhythm (steady on chaps). Musically the track is one to definitely get you going and is a good choice as the band announce themselves. Just for a minute I thought the girls were taking a swipe at me, but it is just the title of the next song 'Deranged'. This one starts off with a nifty verging on funky, in a rock sense, riff. Clare's vocals kick in after the drum crescendo and she provides a great melody to the chorus especially, informing us there have been too many hangovers... is that possible? Drops down superbly in the middle before a nifty guitar solo, rhythm section dragging it along superbly. Another good 'un and less ACDC ish, which is a good thing as they are a lot more than just that. 'The Dangerous Kind' piles in again, speeding guitar and vocals, backing vocals actually catching the ear on this as well. A limb jerker this one, unless of course you have less rhythm than Coldplay, which seems almost an impossibility. A few levels to this one so keeps the groove all the way, boredom isn't an option and quickening vocals and guitar towards the end bring it to a forceful conclusion. A 'Rock 'n' Roll Disaster' appears, but it is definitely not a musical description, just the title track and more classic riffery going on, the solid rhythm plundering the air around it. Melodic chorus is a very catchy addiction, but the whole song rocks your socks and anything else off. Oh and DJ warning…it doesn't quite finish when you expect it to. 'Thunderous' gets into gear in a, well, thunderous fashion, vocals more up front on this one, another well-crafted melodic chorus but you can pretty much take that for granted until told otherwise. Cool and laid back guitar sound on the solo, even if it is anything but laid back in tempo and fills. 'Please Me' has a different feel to it, heavier, faster and with more than a little attitude. Mind you "get down on your knees and please me" wouldn't be anywhere near so believable put politely. It all powers off with the drums before guitars force their way in with an almost punk like pattern, vocals carrying on the direction. Guitar in the middle is very classic rock and the refrain before the song beefs back up is another catchy component. Love it. 'Shoot To Kill' goes back to the more classic stuff, guitars having a party, with bass and drums behind it, bass standing out in the spaces. By the time the vocals fly in, the mood is more than set and that mood multiplies. Clare again shows off her vocal range and shines at the top end especially, but this is a band effort, all of them firing away on all cylinders and probably a few extra ones as well. Guitar wind down before the last choruses fits in very well and breaks the whole thing up dramatically. 'One For The road' is definitely a slow starter and downright cool. A little bass and shake before the vocals in the form of a very soulful mood clincher fills the sound. Guitar chops in, gradually building before the quiet is shattered by cymbalic response, but cleverly it almost immediately drops back down to the bass, drums and soulfulness. It does fire up very soon afterwards with some great six string shenanigans before raucous chorus takes it to its conclusion. Standout track to my ears so far – if nothing else than as a mini showcase showing what they can do. 'Cheers' is next or maybe it should be skål if you come from the Scandinavian parts. Another all-out rocker, quickening vocals putting the message across and it is a message we can all get on with, trust me on that one. There is a little of an Aerosmith feel to the mid guitar section and raucous backing vocals again do a fine job. So to the last one, 'Saturday' and after a few bars of guitar, the drums almost surprisingly power in, giving the song a splendidly frightening kick where it hurts. Great twin guitar licks, riffs and grooves, vocals in party mode, a good old fashioned bar room swagger to the song before it ends almost as suddenly as it started. I have to say, well I don't have to but I will, that this is a very impressive piece of work. They weren't helped as much as they should have been by the business side of things which is a real shame, but that doesn't have anything to do with them nor detract from the album. A lot of prose written about the band puts them down as almost AC/DC clones, but that is a long way from the truth. While they are heavily influenced by them and guitar sound especially is more than reminiscent, but to say that that does them a disservice. There is more than enough variety on this album to disprove the copycat theory. Girl bands are of course another issue that tends to lead to arguments, especially in the rock world and to me the biggest failing with some that didn't make it was a lack of power in the vocal department and that is definitely something that can't be said of Thundermother. Sure, they have appeal in non-musical ways (do I need to spell it out?) but that doesn't sell albums for more than a few minutes. The songs are strong, the musicianship is there in abundance and there is a big future ahead for them if all the right things happen. 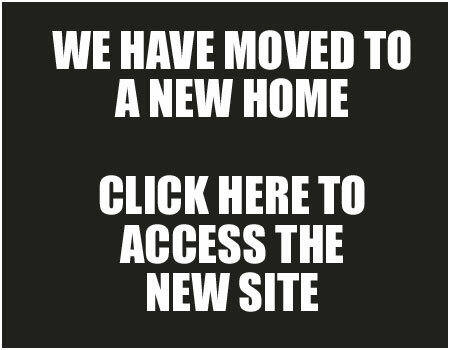 By the time you read this they will be touring the UK briefly so if you can go and check them out and at the very least get hold of the album you will be doing yourself a favour. Thundermother are here to stay and very impressive with it.